Zoning out to this fixie's psychedelic flickering provides waves of delicious zen. Hey, movie projectionist: The screen's too small! And – what the hell? – it's moving away from me at a speed of 20 m.p.h.! OK, so this projection-mapped bicycle wouldn't be the best medium upon which to watch Bullet to the Head. But just zoning out to its psychedelic flickering provides waves of pleasant zen, like a good hacked TV from Nam June Paik. Spoiler alert: The bizarre "plot" of this mechanical movie mixes in images of the Malaysian national flag and passing traffic before culminating in a big ol' plate of messy food (because, I guess, you got to pack on those calories if you're riding a fixie up a hill). The fantastical fixed-gear bike was studiously lit up by digital media artist Ibnu Ambara, who hails from Cyberjaya, the "Silicon Valley of Malaysia." Ambara created his crazy ride to celebrate the blossoming fixie scene in Kuala Lumpur, which to believe from a forums member at Velospace, has "absolutely gone insane." For his part, the artist says in a statement that the "fixed gear is an ideal topic to explore, because it is very current in our society now," especially "among the youngsters." 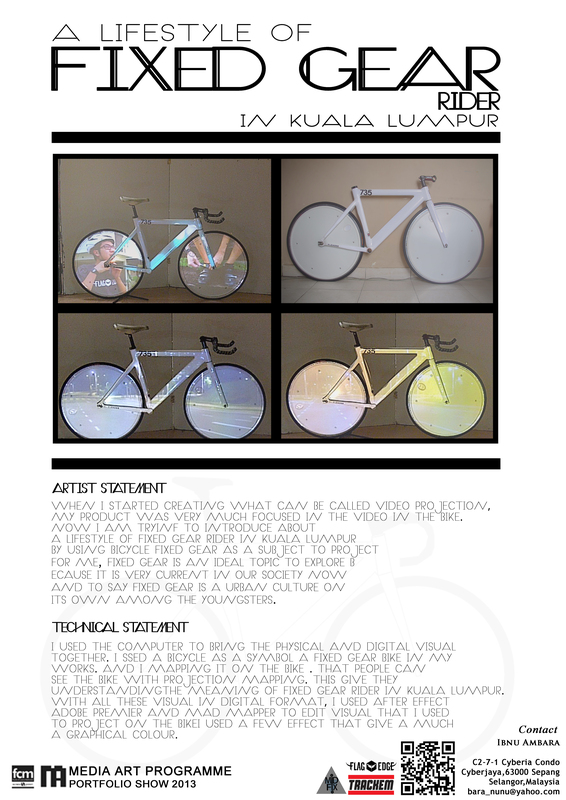 He hopes this artwork will convey to all the "meaning of a fixed-gear rider in Kuala Lumpur."